It is hard to believe that until the middle of last century Hardy Geraniums were only found in the gardens of plant connoisseurs. Today there is hardly a garden, or roundabout or supermarket carpark, that does not have a geranium of some sort planted in it. The characteristics of the genus make it attractive both to gardeners and to landscape architects: most species are hardy in Britain; there is a geranium in flower from March through to October; their habit ranges from demure rosette-forming plants, just a few centimeters tall, to bold plants with dramatic foliage. The single most important reason for their widespread success, though, is that Geraniums will grow in an extremely wide range of situations. Whether your garden is dark and dank or boiling and dry there are geraniums that will thrive in it. There are several selections of Geranium phaeum which have variegated or marbled leaves. The effect of the variegation on most of the plants is to make them look diseased, or as if they are suffering from a lack of minerals in the soil. The most attractive of these variegated plants is Geranium phaeum ‘Margaret Wilson’, which has foliage that is predominately yellow and flowers that have a bluish tinge in the purple but, like many plants with variegated foliage, it is not as robust as the species. 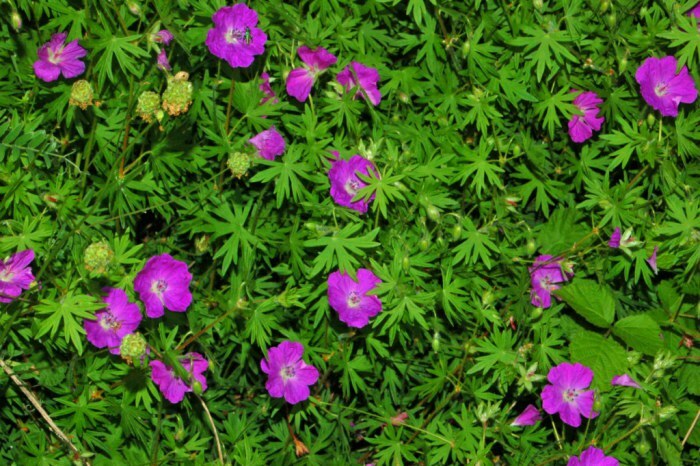 The British native, Geranium sylvaticum, is also a plant for shady places. It grows mainly in Scotland and the north of England in damp soil on the edges of woodlands. In the wild its flowers are a washed-out mauve colour but in G sylvaticum ‘Amy Doncaster’ they are an intense blue and about an inch in diameter. The meadow cranesbill, Geranium sylvaticum, was once a familiar sight in meadows during June and July but now is usually seen growing on the verges of country lanes. In the garden it is a very easy-going plant that will grow in sun or part shade but needs the support of its neighbours to prevent it from flopping over. Most forms grow to about 1m tall and look good growing amongst grasses of a similar height. G sylvaticum ‘Mrs Kendall Clark’ has elegant blue-grey flowers that have pale blue stripes along the petals. Geranium sanguineum cultivars are amongst the shortest of the geraniums, never growing more than about 20cm tall. At the other end of the scale is Geranium psilostemon which in its prime, during June and July, is 1m tall and 1m wide. Its size, combined with bright magenta-purple flowers that have a black centre, make it a striking plant, but its exuberance means that it needs to be placed carefully, either amongst other fiery colours or against artemisias, for example, or other similar, muted plants. It is not a plant for the faint-hearted. Geranium psilostemon is one of the parents (the other being Geranium procurrens) of a number of spectacular hybrids. Geranium ‘Ann Folkard’ has continued to cause a sensation in gardens since it was introduced in the 1970s, its bright-purple, black eyed flowers making a startling partnership with the yellow-green foliage of the plant. The flowers appear from May to the end of autumn on straggling stems that are 1m long. This is not a plant that can be tamed to give a well-ordered effect: you just have to let sprawl wherever it wants to. 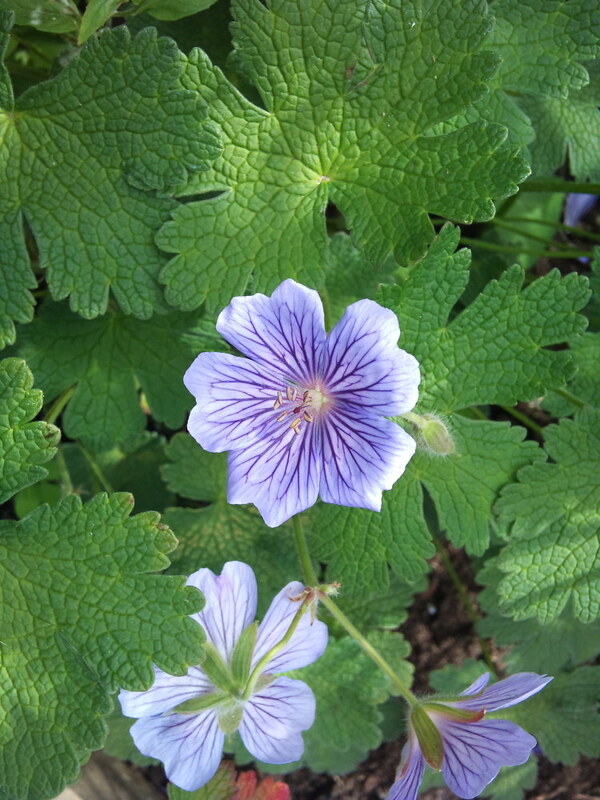 The same parents also produced Geranium ‘Anne Thomson’, a more compact plant with similar flowers. A recent introduction from France, G. ‘Sandrine’, has the same habit and flower colour but with flowers twice the size, at almost 5cm diameter. For a late-flowering geranium you can’t beat Geranium wallichianum ‘Buxton’s Variety’. It starts flowering in July and is still at it in October. As the weather changes, so does the blueness of its flowers, and by autumn they are as blue as gentians. There is a pink-flowered cultivar, Geranium wallicianum ‘Syabru’, but it is a rather sickly pink, reminiscent of Windolene. Geraniums are promiscuous plants and there are hundreds of hybrid plants available. None has achieved the phenomenal success of Geranium ‘Rozanne’ = GERWAT. This long-flowering, compact plant was found as a chance seedling and has gone on to be one of the most widely-marketed plants ever. It has violet-blue flowers about 5cm in diameter that really do match the claim of being produced throughout the summer without the plant becoming leggy. Recent DNA tests have shown that it is genetically virtually identical to G. ‘Jolly Bee’, which has now been withdrawn. A few years ago I imagined a sign that I would like to put on the garden gate: ‘No More Geraniums’. In the two decades following 1987 the number of geraniums listed in the RHS Plantfinder jumped from 125 to over 650. It seemed that hardly a week passed without a new cultivar or hybrid arriving on the market, and the differences between them were often so minimal that choosing which to grow became exhausting. Fewer hybrids are being introduced and many inferior plants have fallen by the wayside, so now is the time to re-open the garden gate and welcome more geraniums in.